In August 2017 there was an eclipse of the sun. In preparing for its viewing at our house in the Hudson Valley two hours north of New York City, I got out of a storage closet binders that contained hundreds of black-and-white and color negatives with accompanying contact sheets dating from around 1978 to 1992. When I was a child we used multiple layers of negatives to view sun eclipses so I figured I could find several dark negatives to use. Come to find out on further investigation of safe eclipse viewing that you should never use film negatives to view eclipses as it could damage your eyes. Ha! That might explain my two cataract surgeries. So, I used the pinhole technique to view the eclipse instead. Since I had the binders out I thought it might be a good idea to digitize my favorite photographs, so I painstakingly went through all of the images and selected the ones I wanted to scan and preserve in our modern digital realm. Then it dawned on me that I could organize some of the images into three photo books. I gathered up the negatives and miscellaneous color slides and sent them off to be scanned. After uploading hundreds of scanned images, I adjusted and resized each one in Photoshop. 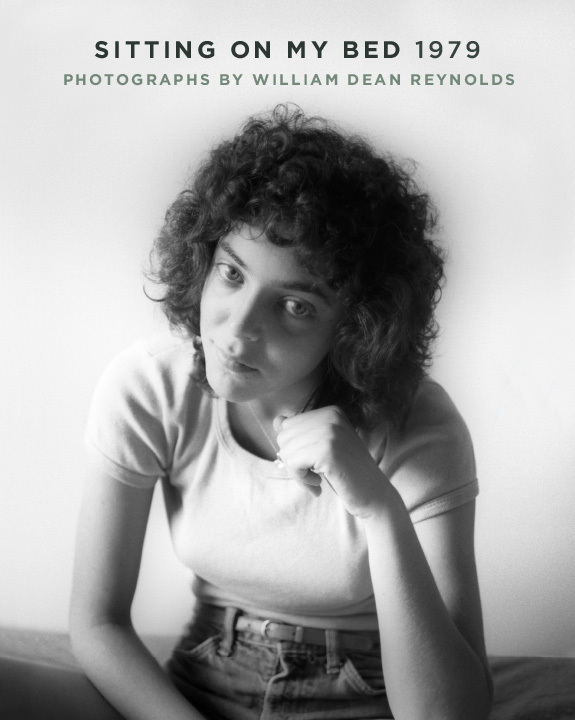 I then designed the layout of the first book SITTING ON MY BED 1979, selecting and organizing the images in a sequence, wrote an introduction, designed a cover, and sent it off to be printed. Then I waited patiently for the books to arrive in the mail and was seriously excited when the package arrived. During the summer of 1979 I moved into a sublet and shared a house on Ann Street in Ann Arbor, MI with five women, most of whom I knew from the residential co-op that I lived in the previous two years. Between the co-op and my copying job, I had made a lot of friends. At some point during the summer I decided to photograph some of the people that I’d gotten to know. The only place I could think of to take their photographs was my small bedroom at the end of a long hall on the second floor of the rental house. The room had a single window facing west with a single bed along a wall adjacent to the window. I convinced the five young women living with me to participate in my project. I then asked co-workers from the copy shop and friends from the co-op. This was a series of portrait photographs that became a jumping off point to a serious life in art. It was also the beginning of my interest in portraiture. The portrait photographs I took on my bed in the summer of 1979 were eventually used for portrait drawings that I began working on in 1983. Friends and companions have become convenient subjects for the large portrait drawings I’ve done since then. I continue to come across altered subway posters as I travel from place to place in New York City. These posters are ripped, shredded and basically messed with which expose the previous pasted advertisements underneath. These panels then become abstract works of collage on subway platforms.